Ok where do I start?? Most websites now are boasting some fairly solid stories which are all very true-the fishing has been very good over the past fortnight especially with favourable fishing conditions. 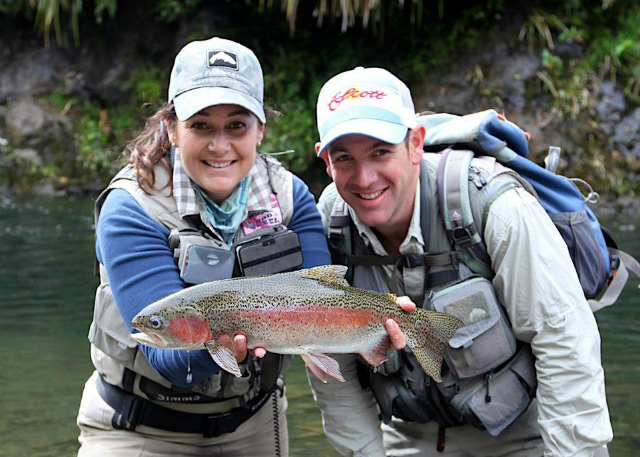 Over the past week I have consistantly caught fish on the dry during the day locally on the Tongariro , landed the first good brown, fought rainbows up to 7 lb in the backcountry and spent some time with some very interesting people on both rafts and quad bike adventures. I must admit we have been very lucky with both experienced anglers but also great weather which has enabled us to get right where I wanted to be. 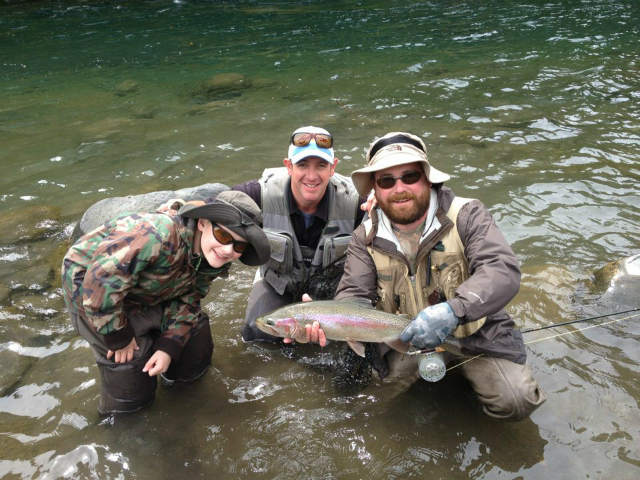 The backcountry has been very good for both rainbows and brownies which all seem to be taking the fly very well and have put on weight quickly in the past month. I havent seen alot of surface feeding and have found pulling fish to the surafce quite difficuilt but sticking the dropper underneath seems to get the attention of most. Levels in the backcountry are low and fish can be seen in all parts of most pools holding in their favourite lies. If you are fortunate enough to come across a brownie in those slow swirly pools just watch what he is up to , if the sun is on the water he will almost certainly be looking up feeding in the film and will be fooled with a well presented Para Adam’s. 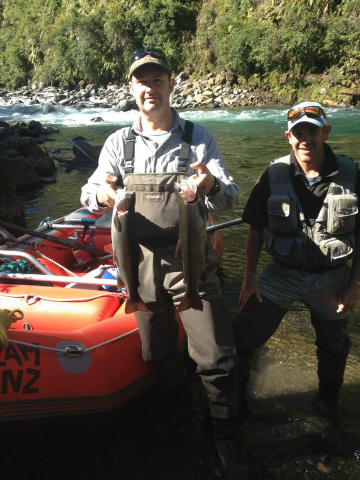 The upper Tongariro continues to fish well from the raft even after a month of fairly good presure most days and the fish seem to be up there in good numbers. I still have a few trips to complete yet over the new year when we should start to see most of these fish drop back to the middle and lower river. We are getting quite a few fish on the Blue Humpy in the fast water up there and they are not shy to move for the fly so this will be worth a try in the middle sections also. The fish will move on but I can assure you that theÂ scenery certainly never will and will be there to be admired by all for quite sometime, it’s a pretty special place. Travis my client from Sydney slammed a beauty of a brown during the week fishing the far side of theÂ Blue Pool , the first I have seen and be involved with this season which is very late now. They will be moving through but the big numbers we are used to seeing have not shown up just yet. 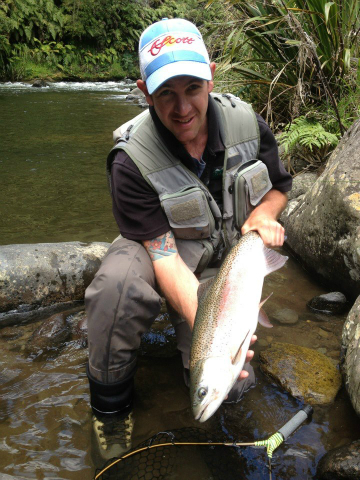 This trout grabbed the Blue Humpy very confidently and Travis tightened up nicely into a fiesty fish which took us a good ten minutes to controll and slip into the net.Â This beast Â had good shoulders andÂ a nice head- may have weighed just under 6lb which is typical of summer Tongariro browns. Most anglers should be landing fish in the Tonagriro most days now, use lighter gear, fish shallow water with riffles and try changing flies about once you have located fish. Obviously presentation helps but all this comes with time on the water and your catch rate will get better quickly. Lake O seems to be doing very well once again and boat fisherman are again getting some very solid trout from the weed beds. Plenty of solid 7lb hens are getting caught currently but for some reason many are being killed?? These are the trophy fish you guys want next year and they are being killed, for godsake take the 3lb fish and save the good breeding -kill them and mount them once they are at the magical mark. Everyone has an opinion on this topic and mineÂ is obvious, something to think about anyways. Fish are starting to move about the river mouths once again on the dark nights as the water slowly warms. Harling on the lake has been lethal with great fish coming to the net and into the smoker for Christmas. I expect the lake to get fairly busy over the next few weeks if the weather behaves and many fish will be taken over the summer break. Have a safe and great Christmas.